"These are your grandmother's crafts...ya gotta problem with that?" I love topiaries. It's true, I do. Yet, inexplicably, this is my very first topiary craft! 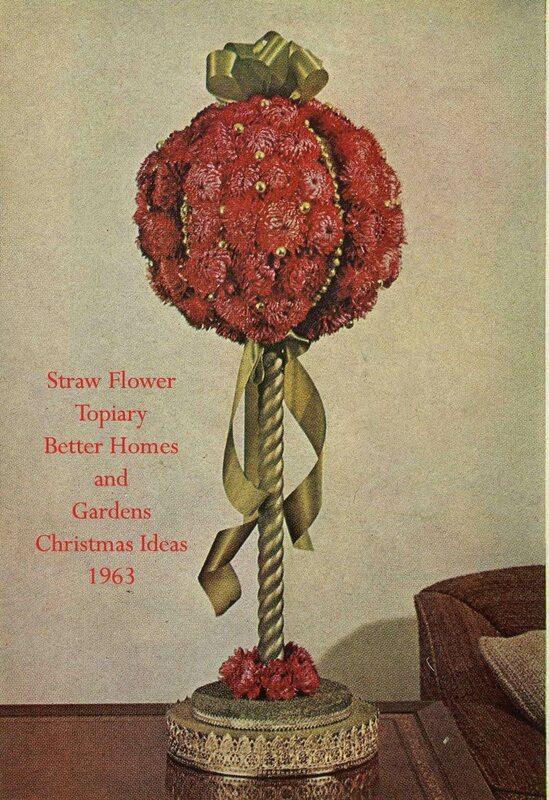 There are a plethora of handcrafted topiaries in my stash of vintage craft magazines, mostly Christmas themed like the one above. I've been meaning to make one and well, the time came. 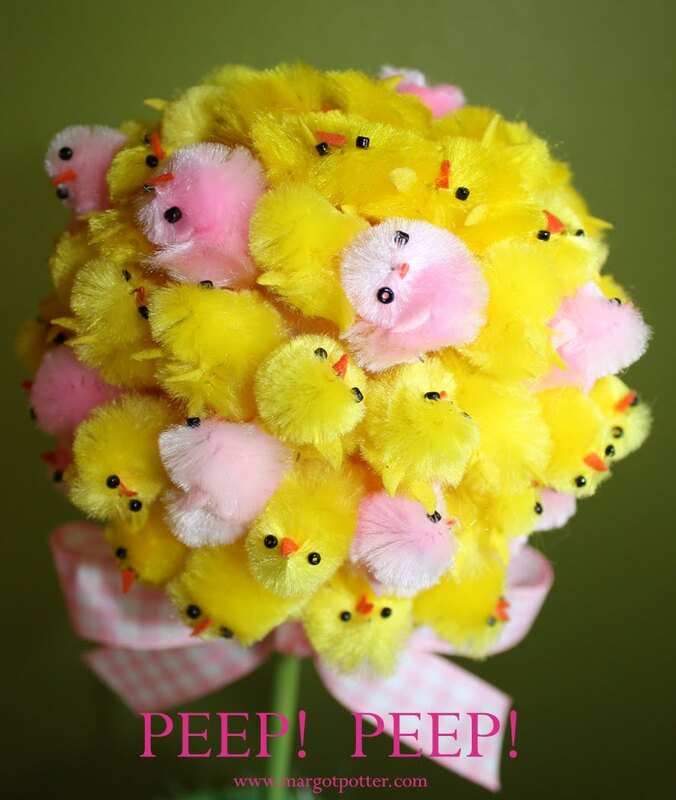 Two years ago Avalon and I bought these little Easter chicks on super sale at Michaels after Easter. We thought we had a lifetime supply, until this idea popped into my head. I ran out of chicks mid-project and had to make an emergency tiny chick run to Michaels, thankfully they had more. What made me want to put tiny chicks on a foam ball? I can not say. But I love it so much it's staying in the living room until after Easter. This is so easy and fun to do. Aleene's Tacky Glue Dots make super quick work of attaching the chicks.You can either use a pot that is already decorated or just mix up some fun colors with your Crafty Chica paints, add some fun trims, toss some Easter grass and either pre-made eggs or jelly beans on the top, add a bow and instant cute! 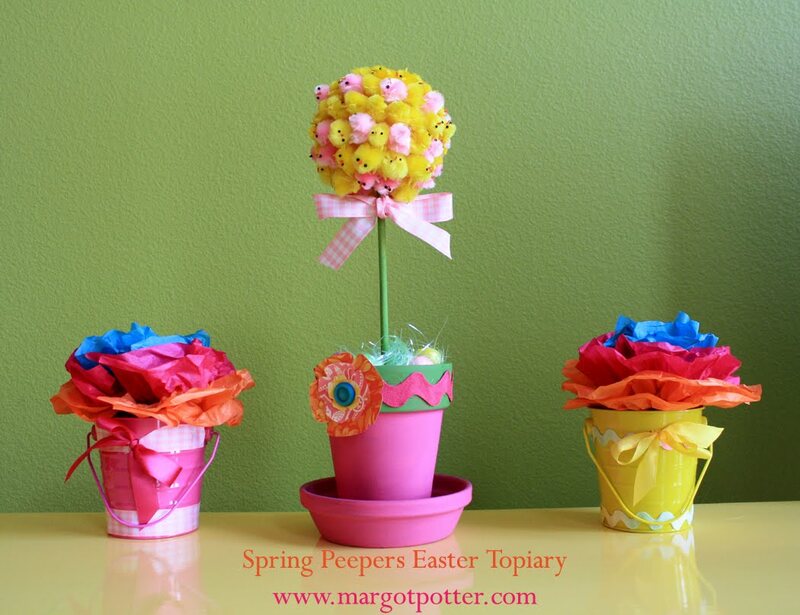 I love this as a centerpiece for Easter, you could make a couple more smaller ones for either side to make a trio. I'm a big believer in the rule of threes. 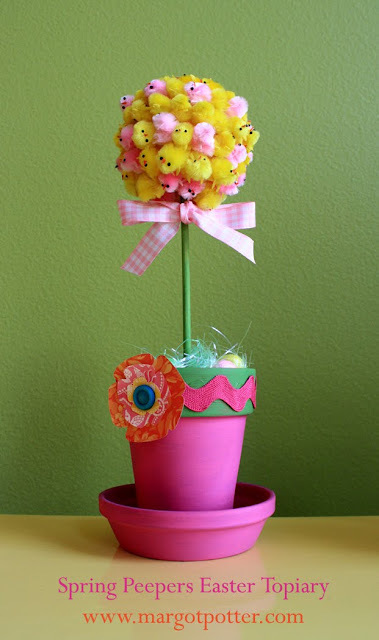 Paint the pot pink and the pot rim and dowel green. Allow to dry. Use glue to adhere ribbon trim around rim of pot. I used super thick rick rack trim. Die cut layered flower and adhere to conceal spot where ribbon ends meet using Aleene's Tacky Glue. Use a Tacky Glue Dot to adhere button to center of flower. 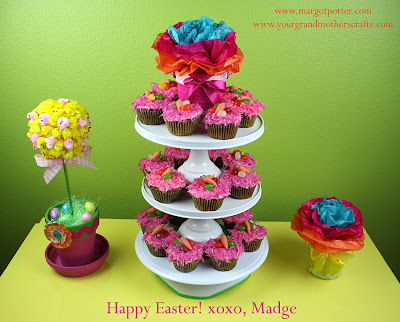 Allow ribbon and flower to dry. Take a chick and press it's feet on a Tacky Glue Dot. Press the chick on the foam ball. Work from the center out, making a ring of chicks all facing the same direction. Work to the center on one side (this will be the top of the topiary) and the center on the other leaving a space for the painted dowel. Once pot has dried, cut foam to fit inside. Add some easter grass to hide foam. 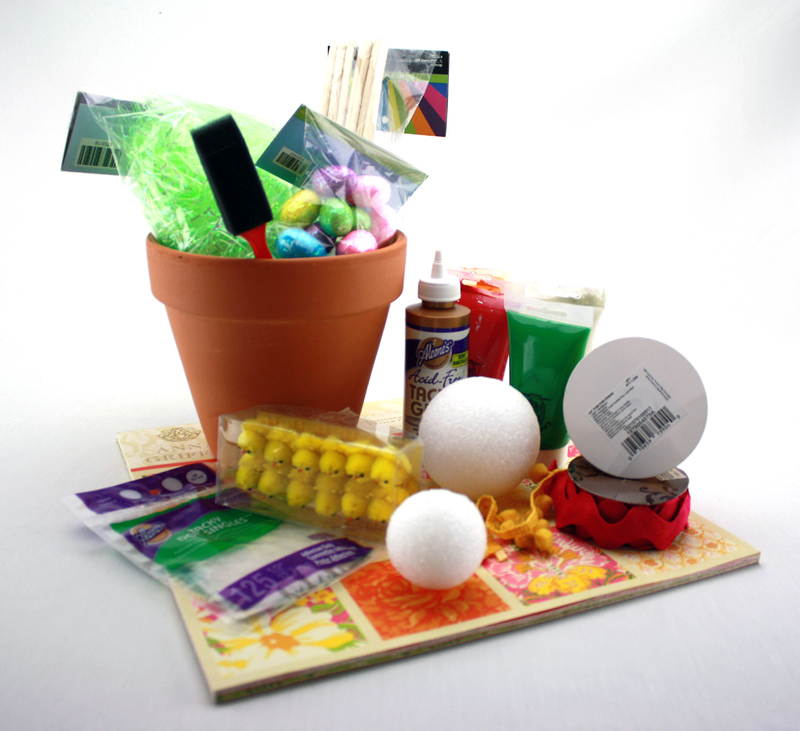 You'll insert the dowel into the bottom of your topiary ball and insert that into the center of the foam in the pot. 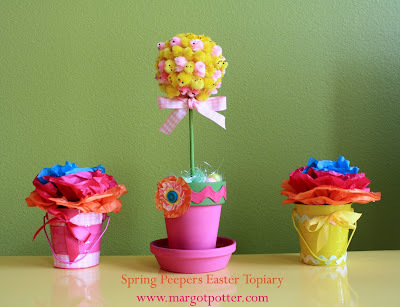 Tie a bow around the bottom of the topiary ball. Make some coordinating decorations to dress up the table...and if you love carrot cake...get the recipe for these Easter Bunny Nest Coconut Carrot Cake Cupcakes today on Your Grandmother's Crafts! That's just about the cutest thing I've seen in ages. Thanks Sharon and Chris! Happy to follow you, Chris. Will do that this morning.